← Having trouble with XBMC since MegaUpload was shutdown? First we’ll explain how to launch Navi-X through XBMC so you can take full advantage of the available functionality. One of the major uses of Navi-X is as a free television solution or alternative to the Icefilms plugin. There are many different ways of getting free TV through Navi-X but one of the more reliable methods is described as follows. I’ll admit – all the content and folders on Navi-x can be daunting at the best of times. By starting to add lists, individual shows or movies or tv network streams to your favorites, you will be able to easily access the best sources you have found simply my going to your favorites on the main screen of Navi-X. I have created my own library of the best resources for TV shows and movies that I have found. I update my library on a regular basis so if you add it to your favorites, you will automatically get access new any new resources that I add. I have also added some of my favorite TV shows and movies. New updates will be added every few weeks, sometimes more or less often depending on the stability of Navi-X. 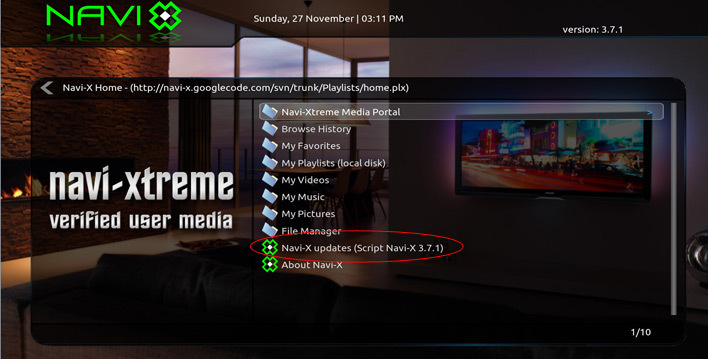 The easiest way to update is to run the script for these updates from the home menu of Navi-X. Having issues opening 1channel on XBMC?